Ernest James Golledge was for twenty-seven years – between 1907 and 1935 – the headmaster of St John’s Boys’ School in Felix Road, Ealing. Situated in a rapidly expanding suburb of London, St John’s was a typical free elementary school of the period. It occupied purpose-built premises on a three-quarters-of-an-acre site, but the number of children on the roll was double that intended by its Victorian founders. Coming from poor, if mainly respectable homes, they were generally undernourished, often infested with lice and, in many cases, inadequately shod. Their expectations in life were pitifully low. Their parents were anxious to put them to work as errand boys as soon as the law would allow, not even aspiring for them to become office clerks. A large proportion of Ernest’s boys had never seen the sea or even been to London. Ernest, a proud Yorkshireman, was notable for his energy and enthusiasm and for his innovative teaching methods. In the pages of the school magazine that he launched soon after his appointment, he declared war on mediocrity and the self-limiting of his boys’ aspirations, urging them to ‘be something, be anything, but mean’. He aimed above all to instil in them the habit of reading. A passionate admirer of Dickens, Ernest was haunted by his example of a deprived childhood – sent to work in the blacking factory by an unfeeling mother – and his salvation through reading. He opened a ‘Dickens Room’ at the school as a shrine to his hero and as a reminder of the success that can be achieved through the love of books. Ernest thought his boys should be exposed to the finest works of art as well as the finest literature. Prints of famous paintings were hung throughout the school, and artefacts displayed from all over the world. Before long, he was boldly inviting some of the greatest men and women of the day to visit the school and address the boys, as living examples of excellence. Ernest’s most striking achievement is the number of famous or distinguished people that he enticed through the school gates – from Queen Alexandra to Lords Haig, Jellicoe and French and countless others. All tended to be in sympathy with his own world-view as an arch-imperialist. Ernest successfully invited a succession of famous explorers to the school. It would be hard, then or since, to think of any speaker more likely to excite an audience of boys than Sir Ernest Shackleton, the Antarctic explorer, who in 1909 had marched further south than any man before him, to within 97 miles of the Pole, thereby preparing the way for the expeditions in 1912 of Amundsen and Scott. Shackleton was even then deep in preparations for his next trip to Antarctica – the Endurance was to embark on her fabled voyage from Plymouth on 8 August 1914 – and must have been frantically busy, yet he found time, that April, to contribute to Ernest’s series of talks for the Livingstone Centenary. According to Ernest, he delivered ‘a delightfully graphic account of the  expedition’, emphasising the pluck, loyalty and devotion to duty of his comrades. ‘Several of the stories he told of almost certain death to himself and others held the boys breathless with excitement e.g. : he fell down a chasm 1,000 feet and was only just rescued in time by Mr Wild when four of the five strands of the rope which held him in suspense had given way. On another occasion he broke a blood-vessel and heard Dr Wilson say that he couldn’t live until morning. When their rations were reduced to 18 ozs. per day per man, these heroes would share their food with their ponies.’ Both Shackleton and Frank Wild, his loyal collaborator and confidant, will reappear in Ernest’s story. Shackleton helpfully reinforced Ernest’s own persistent message that ‘“imagination” is a splendid incentive to “strive on”’. The explorers had had a substantial library of 3,600 books on the Nimrod, from which they had packed a small selection onto their sledges before setting out for the Pole. These were Dickens’s Sketches by Boz, Borrow’s Bible in Spain, Shakespeare’s Comedies and Scott’s Ivanhoe. In conclusion, Shackleton told the boys that ‘they all had a “pole” or “goal” to aim at in their lives, and the requirements for an arctic expedition were equally suitable to them viz. : Ideals, Patience, Physical endurance, Optimism, and Co-operation’. It would have been superfluous, if not presumptuous, for Ernest to add to his remarks. He merely said ‘Thank you, Sir Ernest’, and called for three cheers. 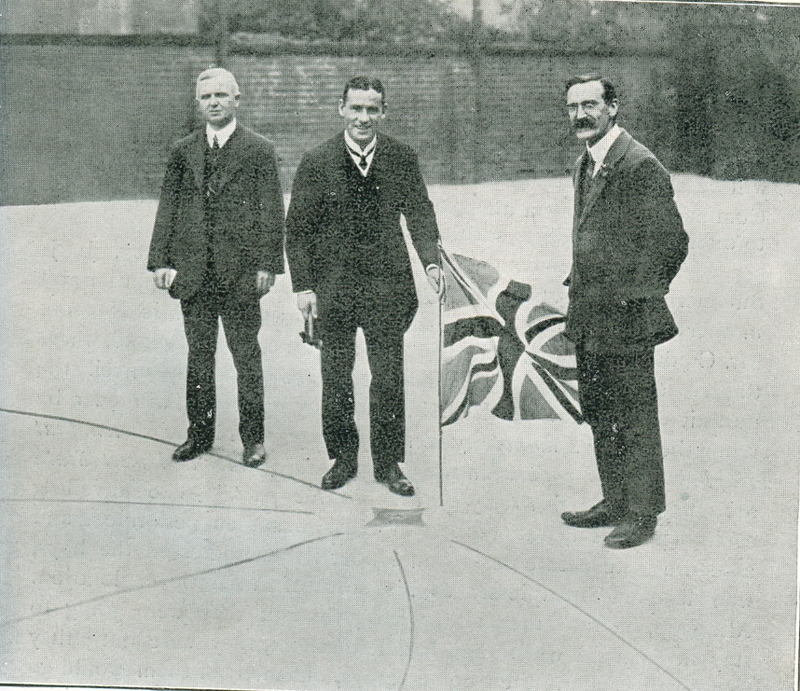 Left to Right: Ernest Golledge, Commander Teddy Evans and F. Klein, the assistant master who laid out the playground map, at St John's School, Ealing. Klein was later killed in the war. Three months later, Ernest achieved another impressive coup. His near neighbours at ‘Wynnfield’, Sutherland Road, were the barrister Frank Evans and his wife, parents of Commander E.R.G.R. ‘Teddy’ Evans, R.N., second-in-command to Scott on his last, fatal expedition to the South Pole. By 1916, the Golledges were on sufficiently close terms with the family to be invited to Teddy’s wedding. It took place at Christ Church, Westminster, the guests including Lady Shackleton and the mother of the gallant Captain Oates. The bride, Miss Elsa Andvord, was described by an admiring reporter as a beautiful Nordic goddess. As the leader of the survivors of the British Antarctic Expedition (his experiences had been truly harrowing, though he was not one of the party that made the final push to the Pole), Teddy Evans – the future Admiral Lord Mountevans of the Broke – was invited to St John’s on 16 July 1913, to unveil a portrait of Captain Scott. With his alert, handsome face and sturdy figure (though he was not much taller than Ernest), Evans was the archetypal ‘Boys’ Own’ hero. He began the proceedings by driving a steel peg into the middle of the star that marked the South Pole on the huge playground map, along with a Union Jack. The boys then listened with rapt attention to an account of his adventures. They laughed when he said they went 150 days without washing, and when they heard that Petty-Officer Crean had lost his trousers while sliding down the ice (‘though they realised it was serious when they looked into the matter’). They were fascinated to learn that the explorers thought of nothing but food, and of their fantasising about meals in the Hotel Cecil or from the corner fish shop, according to their rank. The message from this fine example of manhood was ‘that life was just slogging on, and the amount of success achieved would depend on the way we slogged’. As for Captain Scott, ‘he set you a fine example to play the game, how to strive for the right, and how to die’. For good measure, Ernest also sent invitations to Roald Amundsen (in November 1913) and to Sir Douglas Mawson, leader of the recent Australasian Antarctic Expedition. Amundsen’s sister was in charge of his correspondence and thought it unlikely that he would be returning to England. Mawson, responding in May 1914, regretted that he would be leaving shortly for Australia, and had ‘but 2 months in which to write a book describing the whole expedition’. Disappointingly, neither man ever made it to St John’s. When Shackleton returned from his Antarctic adventure in May 1916. Ernest was unable to engage him for a talk, but settled for his unassuming right-hand man, the ex-Merchant Navy officer – and son of a Yorkshire schoolmaster – Frank Wild. 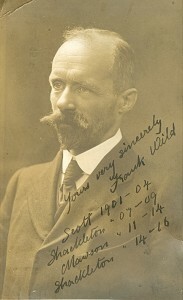 Gaunt and tough, with thinning hair and a large moustache, Wild was a huge attraction. Introducing him on 11 January 1917, Frank Evans, the father of Commander Evans, said he knew from his son that Mr Wild had ‘done more walking in polar regions than any other man, alive or dead … He was as fond of a cold climate as a polar bear.’ He was to list the four great expeditions of which he had been a member on a signed, postcard-style photograph sent to Ernest in 1917: ‘Scott 1901-04, Shackleton 07-09, Mawson 11-14, Shackleton 14-16’. It is one of the treasures of the Golledge archive. Wild’s enthralling, two-hour lecture included accounts of all four expeditions. He mentioned casually ‘that the temperature experienced was often as low as seventy-four below zero’. He spoke appreciatively of Shackleton’s ‘self-sacrifice and determination under adversity’; of the advantages of ‘abstinence from alcoholic liquors and smoking during sledge journeys’; of the ravenous cravings for food. One comrade, he said, had lived for weeks on an exclusive diet of limpets and sea-weed, the latter acting as a ‘tonic’. The boys and girls were fortunate indeed to hear such a speaker. Wild had been the inspirational leader of the Elephant Island party, while Shackleton, in search of help, had embarked on an 800-mile journey across the Southern Ocean in an open boat. It has been justly called one of the greatest adventures of all time. Rupert Willoughby has just completed a commission to write a biography of Ernest Golledge, based on his archive, which is in private hands.